This Easter, step away from the chocolate bunnies and jellybeans and go out and get a real meal. 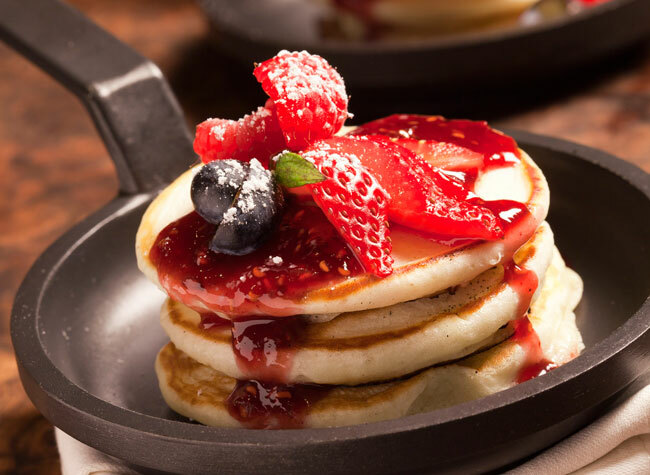 Lots of restaurants in Las Vegas are ready to help you celebrate the holiday with special brunches and dinners, so let someone else do the cooking and enjoy a great Easter meal out. Hash House A Go Go at The LINQ and The Plaza: Hash House will be serving Easter brunch until 5 p.m. 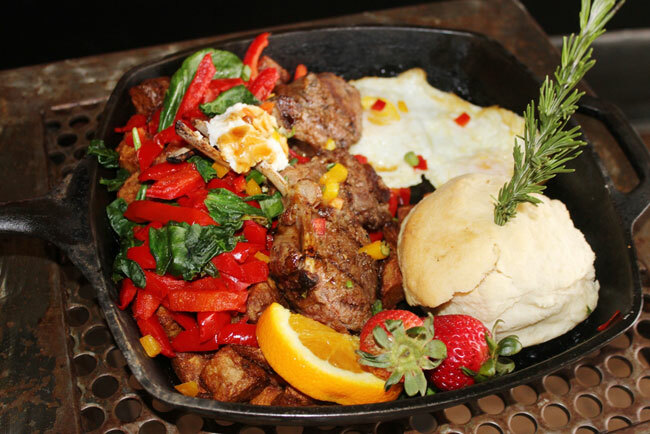 Specials include lamb chop hash made with crispy potatoes, lamb chops, roasted red peppers, spinach, goat cheese and two eggs served with a fresh buttermilk biscuit ($16.95). There’s also a butterscotch almond pancake topped with fresh whipped cream ($9.50) and the roast chicken Benny – a biscuit, spinach, mushrooms and house-roasted chicken topped with two eggs over-easy and basil. Hash House will also offer specialty brunch cocktails including a blueberry lemonade margarita ($8.50), the Cinnamon Roll A Go Go ($5.25), Tangerine Kiss ($8.50) and HH Gin Mary aka “The Hangover Cure” ($10.95) with lemon, stuffed olives and a cucumber slice. Brio Tuscan Grille at Town Square and Tivoli Village: Brio invites guests to celebrate Easter with Bunny Brunch from 9 – 11 a.m. The buffet features French toast, scrambled eggs, savory sausage links, bacon, fresh biscuits, muffins, fruits and parfaits, along with fresh coffee, juices and soda. There will also be photos with the Easter bunny, an Easter egg hunt and more. The price is $11.95 for adults and $5.95 for kids. Bistro 57 at Aliante: Enjoy an Easter dinner Italian-style. 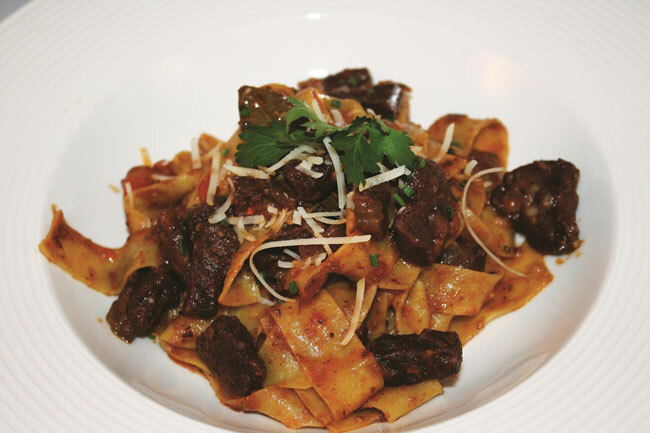 Bistro 57 will serve a special meal of lamb ragu with pappardelle for $20. Gospel Brunch at House of Blues at Mandalay Bay: Easter brunch will take place on April 5 with seatings at 9 a.m., noon and 3 p.m. Kids will be welcomed with a basket with Easter eggs filled with prizes and treats, and the Easter Bunny will make a special appearance to take photos. Adults can get in on the fun too with a raffle for tickets to upcoming House of Blues performances. The all-you-can-eat Gospel Brunch features Southern specialties, a live carving station with oven roasted turkey breast and prime rib, chilled prawns with cocktail sauce, chicken jambalaya, chicken and waffles and an array of salads and cold items, plus create-your-own bloody Mary and mimosa bars. 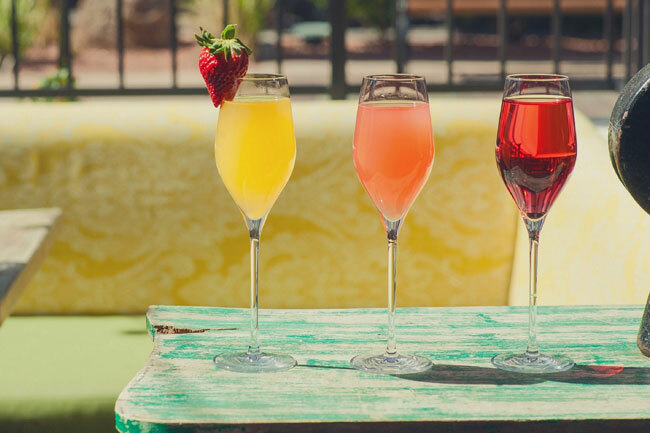 Mercadito at Red Rock Resort: This Mexican eatery will be serving Easter brunch from 11 a.m. – 4 p.m. Diners will enjoy a $30 per person sharing menu including four brunch entrees for the table plus one cocktail under $10 (per guest). Two-hour bottomless mimosas will also be available for $25. La Cave Wine & Food Hideaway at Wynn Las Vegas: La Cave is always a great spot for brunch and for Easter they will offer a butler-style brunch with tableside service from 10:30 a.m. to 2:30 p.m. Brunch is priced at $48 per adult and $28 per child for unlimited food. The menu includes: pancakes with berry compote, corn flake crusted brioche French toast, baked potato loaded tater tots with brown gravy, New York style egg sandwiches, scrambled eggs, chef’s selection ham egg flatbread, eggs Benedict with chorizo, veal short rib hash, yogurt parfait with granola, tomato and mozzarella salad, Angus mini burgers, mushroom grits and more. For an additional $20 per person, you can indulge in bottomless beverages like mimosas, sangria, sparkling wine, bloody Marys and build-your-own mojitos. Carmine’s in the Forum Shops at Caesars: If you have a group, Carmine’s has a feast that will feed four to six people. You’ll get a roasted rack of lamb with Easter egg bread ($85.50). The meat is topped with red wine, sun-dried tomatoes and a brown sauce. 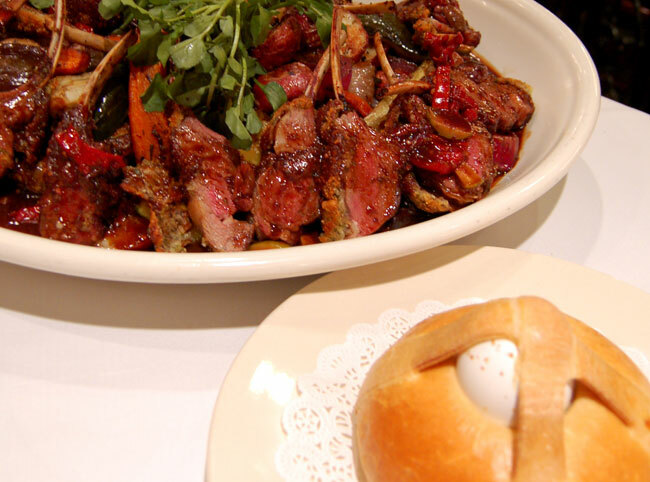 Rao’s at Caesars Palace: Rao’s will be serving several special selections for Easter including a sausage & potato soup ($16); rack of lamb ($49); and vanilla panna cotta with a cherry consume gelée, Bing cherries and toasted almonds ($14). Trevi at the Forum Shops at Caesars: Trevi will be serving food and drink specials for Easter including grilled marinated New Zealand lamb chops served with mint basil pesto risotto and grilled asparagus, priced at $34.95. You’ll also find a limited-time jelly bean gelato for dessert, starting at $4.50 per scoop, along with a festive Peep-tini cocktail for $9 made with marshmallow vodka and garnished with Peeps candy. 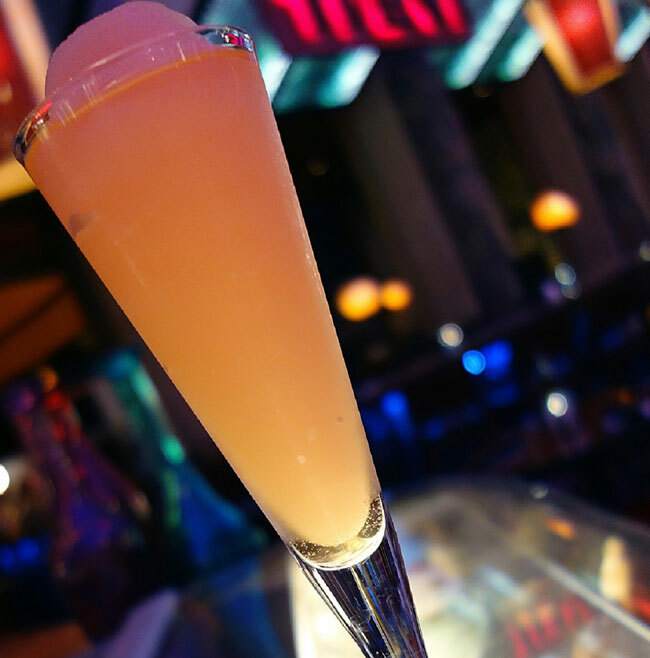 Trevi’s signature happy hour frozen Bellinis will be offered for $4 throughout the day. Hofbräuhaus Las Vegas, 4510 Paradise Rd. : Celebrate Easter Bavarian-style with a special menu that includes asparagus soup “Black Forest” with ham, croutons and chives; asparagus salad with tomato vinaigrette; herb crusted lamb chops and Frischer Erdbeerkuchen, a homemade strawberry cake served with vanilla sauce and ice cream. Whist Stove and Spirits at The District at Green Valley Ranch: Whist will celebrate Easter with a “Sunday’s Best” Easter brunch, served from 10 a.m. to 4 p.m. Special fare will include spicy chorizo and eggs with sopes priced at $13; and sweet ricotta crepes, topped with fresh blackberry and strawberry compote, priced at $11. In honor of the holiday, a handcrafted Easter basket prepared with complimentary fresh pastries will be served at each table. Whist will also offer their signature bottomless brunch cocktails, priced at $22. T-Bones Chophouse at Red Rock Resort and Hank’s Fine Steaks at Green Valley Ranch: These two restaurants will be pouring specialty cocktails including the Peanut Butter Easter Egg (Godiva Chocolate Liqueur, Smirnoff Whipped Cream Vodka, peanut butter infused simple syrup, half & half and a Reese’s Peanut Butter Egg) for $12, as well as the Peep Peep (Bombay Sapphire Gin, peach schnapps, strawberry syrup, fresh strawberry and fresh lemon juice) for $12. Brunch plates include sweet treats like the bananas Foster French toast ($18) and the pancakes soufflé-style ($19) in addition to savory dishes including steak and Scotch eggs ($39) and egg white frittata ($19). Desserts include The Egg (homemade vanilla bean ice cream, strawberry sorbet and meringue) and Monkey Bread (sticky toffee monkey bread paired with homemade maple ice cream). Border Grill at the Forum Shops at Caesars: Border Grill will be serving Easter Sunday dinner specials including signature cocktails like the sweet coconut mojito (Cruzan rum, coconut, lime, mint) for $12 and the refreshing blood orange sangria (white wine, blood orange, apples, strawberries, vodka) for $12. Small plates include a roasted beet and goat cheese salad ($14) and mango habanero ceviche tacos ($16). Savory entrees include a chile Colorado lamb (slow braised lamb shank, chile Colorado sauce, green garbanzo beans, guacamole, pickled onions) for $36 and pan seared shrimp & scallops ($38). The menu is completed with a ginger tres leches ($8) for dessert. Cleo at SLS: Cleo invites guests to enjoy a tasty spread of Mediterranean cuisine and libations from 10 a.m. to 4 p.m. Sunday, April 5. Cleo’s all-you-can-eat menu is priced at $45 per person, excluding beverages, taxes and gratuity. Menu items include breakfast pastries, eggs Benedict, waffles, a Shawarma station featuring a carved leg of a lamb with lebaneh and harissa, grilled chicken tagine with olives and saffron rice and more.